That's much better. I don't know what happened. Your image is exactly what I have, all I did was reduce it and sent it and it went out of focus between my computer and the forum. I should say: Sable billetty Or a Vihuela bendwise Or stringed Gules . 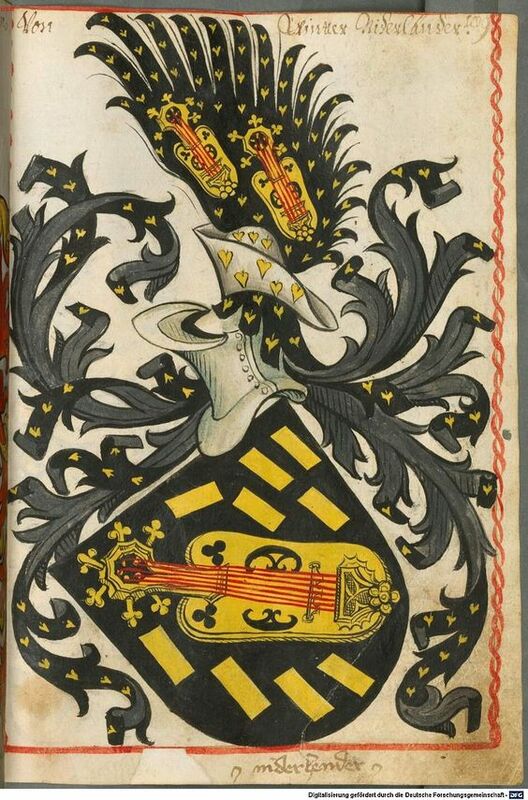 I realise that billetty (semy of billets) is usually taken to mean that each billet should br upright and that the design should seem to extend beyond the edges of the shield. However the artist who executed this emblazonment played fast and loose with with the billets so I feel no qualms about calling the design billetty rather than "nine billets". How would one begin to explain the assorted angles? I think the instrument is a vielle, a medieval type of violin. Could well be. Not clear (to me) whether the vihuela and the vielle are not simply regional versions of the same basic instrument.